The V.I.O. Ultra Clamp mounts your V.I.O. camera to different items from 1/8 to 1 5/8" for capturing new and different angles. Attach your POV.1 camera to your car window, bike seat post, boat, or really anything you can think of. Use it with flex mounts or as a stand alone for capturing exciting shots of all your adventures. Box Dimensions (LxWxH) 5.5 x 3.15 x 1.25"
Ultra Clamp is rated 4.4 out of 5 by 10. Rated 5 out of 5 by jcdovala from Great clamp This clamp is well made and very versatile. I've used it on everything from vibrating boat railings to flat wood edges and it holds! With the adjustable mounting column you can get the camera to point anywhere you want no matter what it's clamped to. Obviously, extremely heavy camera bodies may be problematic but it can hold my D700/17-35mm, and D5100/24-120mm (video) well enough. Rated 4 out of 5 by Anonymous from This clamp worked better than expected Once this clamp and GoPro were attached to the guitar head it stayed. I was a bit on edge being the guitar head was a Stratocaster type head and was attached at an odd angle. I did not think enough of the clamp made contact with the guitar head, thankfully I was wrong.The only issues is figuring out the correct angle to use so the guitar player does not look as if they are playing on their back, but that is an operator issue. 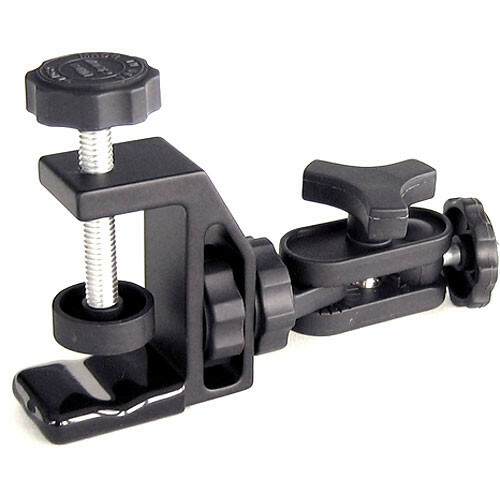 Rated 2 out of 5 by Anonymous from It is a great clamp BUT... After using it about 5 - 7 times the bottom screw (black plastic) would detach itself from the rest of the unit when trying to remove the mount from a guitar. Also the rubber (that secures against the guitar) is coming undone. I had to reattach it with super glue, so far it inholding. The clamp worked great until this happened, VIO needs to find a better way to secure this piece to the rest of the clamp. For this issue alone I cannot recommend this clamp. I really wished this did not happen because up to that point it worked great. Rated 5 out of 5 by Anonymous from Ultra Clamp by V.I.O. You can use this to clamp a Zoom H4n Handy Recorder to the base of a boom-pole so you can monitor the levels while you record the audio through the microphone. Rated 5 out of 5 by Anonymous from Great for mounting camera to many things ultra clamp is going to be very useful, now ai will be able to mount my camera to my bike,golf cart ,and my boat . The clamp is very well made . Rated 4 out of 5 by Anonymous from Great Clamp for the buck The clamp is very sturdy. Built in aluminum, but the other piece is plastic. I almost give this review of 5 star if the other piece is aluminum.